In the Victorian era, dentures were a popular wedding gift. The assumption being that, eventually, one or both of the married couple would need them. Today, advances in oral hygiene products and an increased awareness of the need for preventive dentistry mean fewer patients need dentures. However, there are some patients who do suffer advanced tooth loss caused by injury, chronic gum disease, and other oral and overall health issues. When widespread tooth loss occurs, the Jacksonville Complete Dentistry team is here to help. Unlike those “one size fits all” dentures given out as Victorian wedding gifts, today’s dentures are custom crafted from quality materials. They don’t look fake, shouldn’t slip around in the mouth, and can last for years with proper care and regular maintenance. Contact our Jacksonville dentist and team to find out more or schedule a tooth replacement consultation. 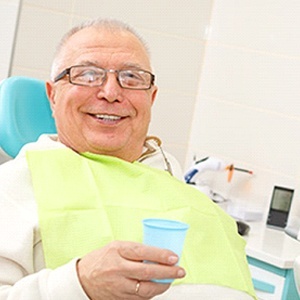 Why Choose Jacksonville Complete Dentistry for Complete & Partial Dentures? Partial dentures, sometimes simply referred to as partials, are used to replace any number of consecutive or nonconsecutive teeth when there are enough healthy teeth remaining to support this tooth replacement prosthetic. Partial dentures use a gum colored base material to anchor replacement teeth. This base is attached to remaining healthy tooth structure using metal clasps that provide adequate support for the replacement teeth. 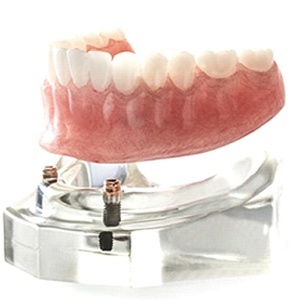 The most important job of a partial denture is to protect existing teeth. Partials do this by offering support and protection of the existing teeth. They also replace the missing teeth to allow the patient to regain function and smile again! Similarly crafted using a gum colored base material to support replacement teeth, complete dentures do not have remaining healthy teeth to provide support. Instead, the denture base is molded against the gum line creating friction and suction that holds the denture in place. Complete dentures truly are a total tooth replacement. Our doctors are thoroughly trained to craft complete dentures so that a loss of teeth does not disable the patient. In the past, when someone had dentures it was obvious. With our techniques and materials, most people will never know you wear dentures. Customized acrylic or porcelain teeth appear life-like and our doctors’ custom make your dentures based on the shape of the face, the lips, and speech. The results can truly be transformative! 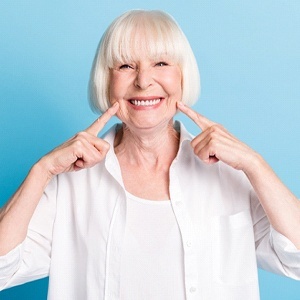 Patients who want to further improve the stability and longevity of their partial or full denture might want to consider dental implant retained prosthetics. Dental implants are small titanium posts inserted into the gum line where they mimic the root systems of lost teeth. Some patients do not have the optimal number of teeth to retain a partial denture. Implants can replace metal clasps and create a partial denture that can be stable, supportive, and retentive. Implants used for complete dentures can help retain a denture significantly, leading to dentures that are much closer to a complete replacement of teeth. Hybrid dentures and overdentures combine a custom, removable tooth replacement prosthetic with the increased comfort and stability of a dental implant supported denture. With an overdenture, two to four implant posts are placed below the gum line, and your current denture or a new prosthetic is fitted with attachment pieces. It’s then snapped into place over the top of the implant posts, creating natural looking and feeling support. At night, you can remove the prosthetic for easy cleaning and complete comfort. For many patients, this is the ideal tooth replacement solution. When choosing a hybrid denture, five to six implants will be placed within the jaw. Unlike an overdenture, the hybrid prosthetic is screwed securely onto the implants and should be considered permanent. 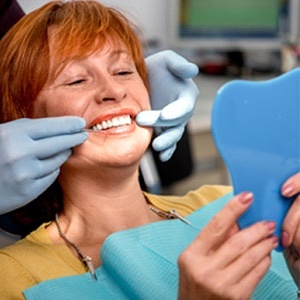 The only time the denture will be removed is by our dental team for periodic cleaning. Many patients prefer this tooth replacement option, as their new “teeth” are connected directly to the implants and allow for much more effective chewing.